The success story continues: find out more about the new products created by Italian designer Antonio Citterio for his existing collection for the Axor Citterio brand. 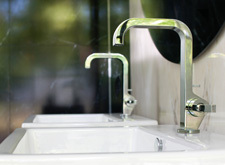 Luxury at a second glance: The stylish additions from Axor Citterio expand a pleasantly timeless collection. Clear in form, rich in detail, abundant in possibilities: the latest Axor Citterio products give life to the precious element of water.